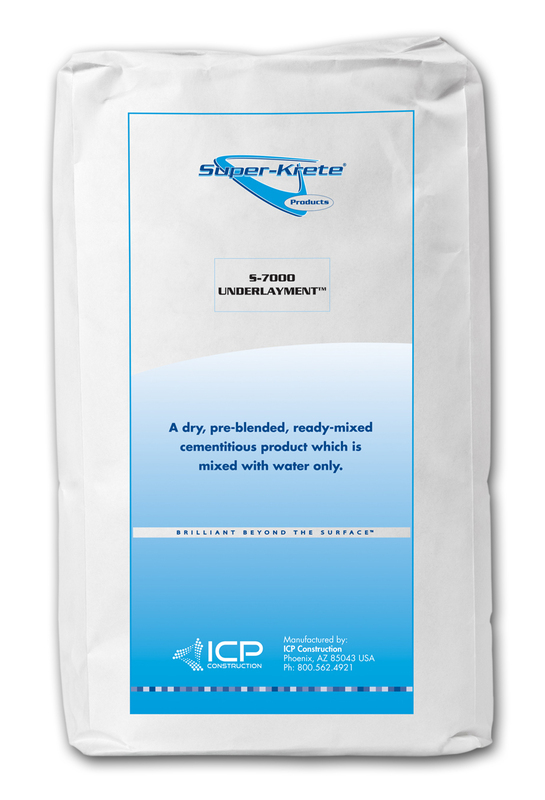 S-7000 Underlayment™ is a dry, pre-blended, ready-mixed cementitious product which is mixed with water only and is used as a leveling, re-grading and sub-floor material over concrete and wood substrates. S-7000 Underlayment provides a co-adhesive bond with the substrate and is fire and water resistant. S-7000 Underlayment can be installed in any thickness ranging from 0"-6". It can achieve strengths of 8,500 psi, yet remain flexible and resilient. S-7000 Underlayment is typically used for underlayment over existing concrete surfaces and above-grade wood decks. It is also used for structural repairs of bridges, parking structures and many other cementitious substrates.